Hi there ! Such a beautiful Wednesday morning isn’t it? No matter how much we cribbed during summer, Bangalore keeps giving proof of why it’s the best city ever 🙂 I don’t want to get out bed so I’ll just be snuggling under my blanket for a while longer. If you’re on your way to work or just being lazy a while longer, I hope you’ll give this post a read before you start off your day . 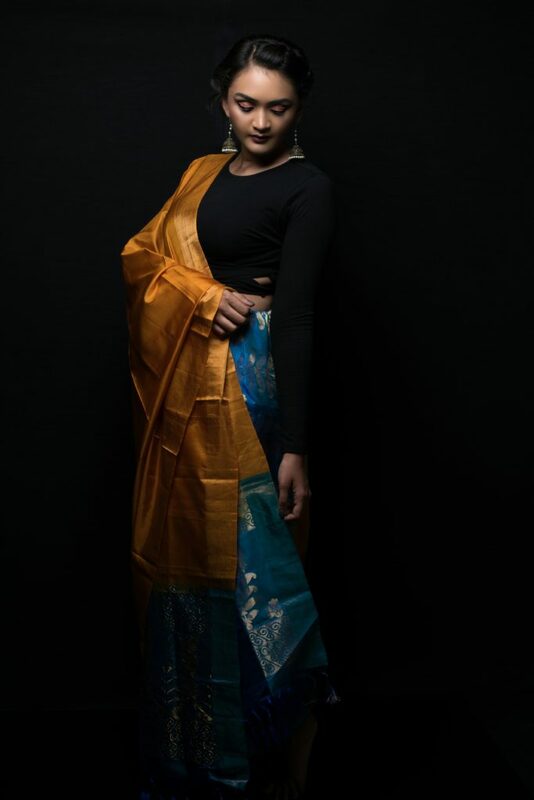 We live in India, the country where the beautiful saree originated but hardly anybody wears them anymore, maybe because they’re uncomfortable, maybe because they’re not ‘cool’ enough or maybe because we just haven’t had the chance to experiment with them. 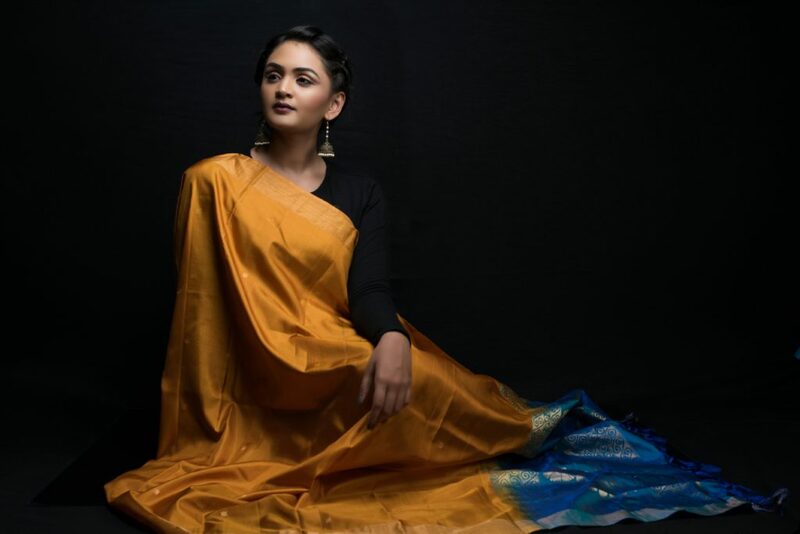 I collaborated with My Roots, a group of entrepreneurs who connect consumers to their roots by introducing the artisans behind the products, the processes of making of the product and the most authentic Desi products, to bring to you this post where I give you 9 reasons to embrace the ever so elegant saree and also show you how I styled their sarees ! Read on..
1.They flatter just about any body type, YES! Apple, pear, hourglass, etc? Nah..ain’t nobody got time for that. 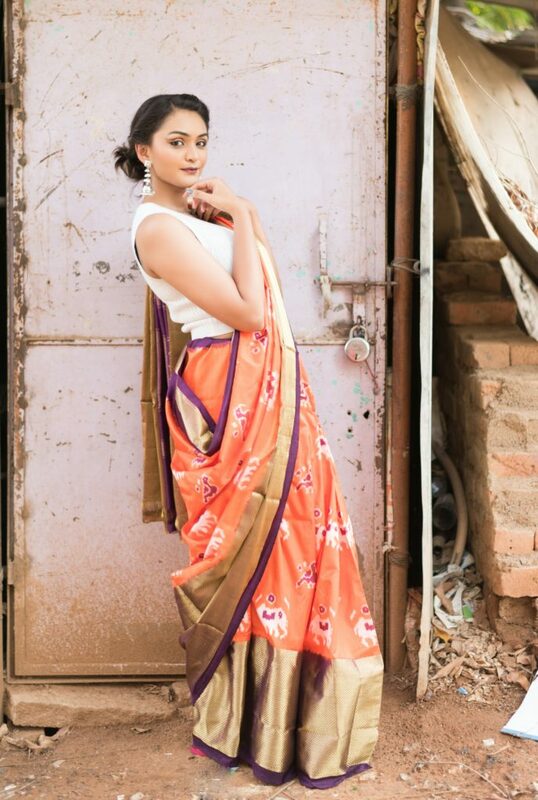 A saree can make any woman look beautiful, if you’re on the heavier side, Opt for lighter fabrics and sleek drapes. On the lighter side? 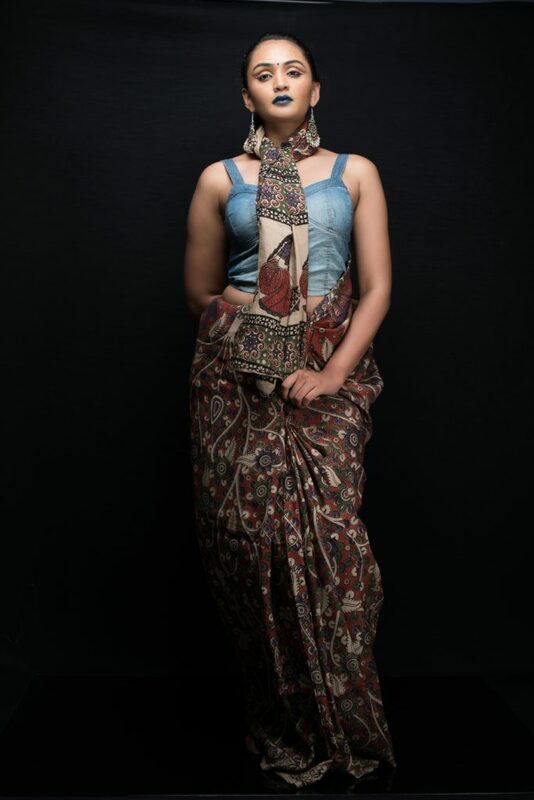 A saree like the one I’m wearing will add some weight to your petite frame. 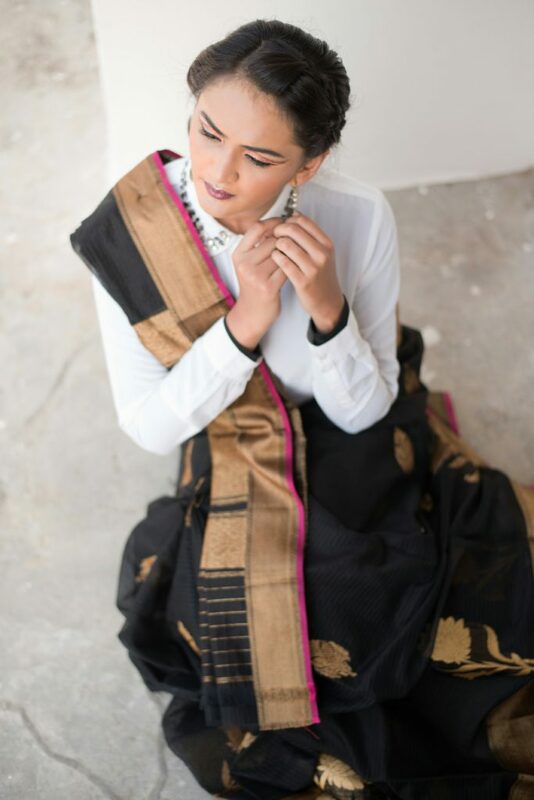 2.Draping a saree might look like a task at first, but once you get the hang of it, you can do it with closed eyes. Don’t believe me? ask your grandmother who wears a saree so effortlessly every single day. You don’t have to worry about coordinating 10 different things, pick a saree and a blouse and you’re sorted my friend. 4. 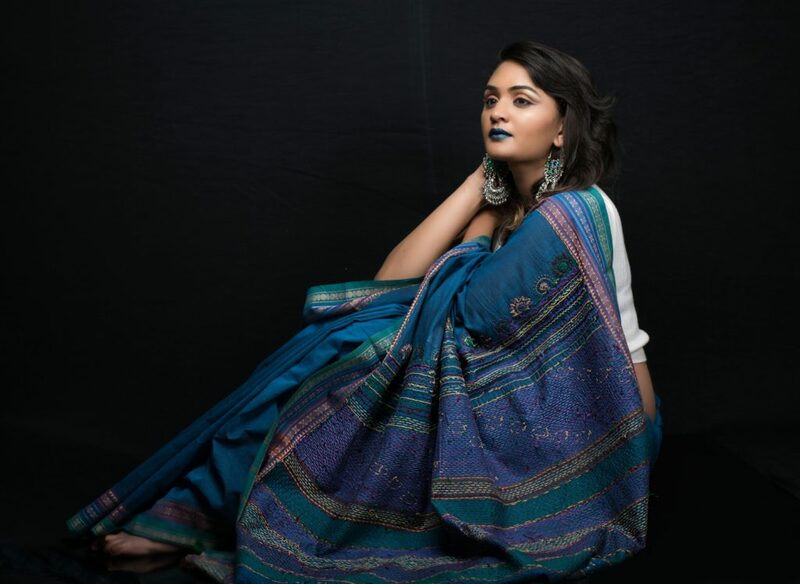 For curvy girls, take this from me, sarees are your Holy Grail. No exaggeration! No outfit can flatter a woman’s curves more than a saree does and I don’t think anyone will disagree. 5. A saree is suitable for any occasion , period. From a school principal to a working woman to celebrities, a saree has been worn on multiple occasions and made heads turn every single time. Aishwarya Rai has rocked a saree at Cannes and how can we forget how beautiful Rekha or Sridevi look in their sarees on filmfare and award nights. 6. Sarees are season friendly, there is a fabric for every occasion. Georgette, Silk, Cotton, Raw silk, chiffon,crepe, I can go on and on. The list is endless. 7. 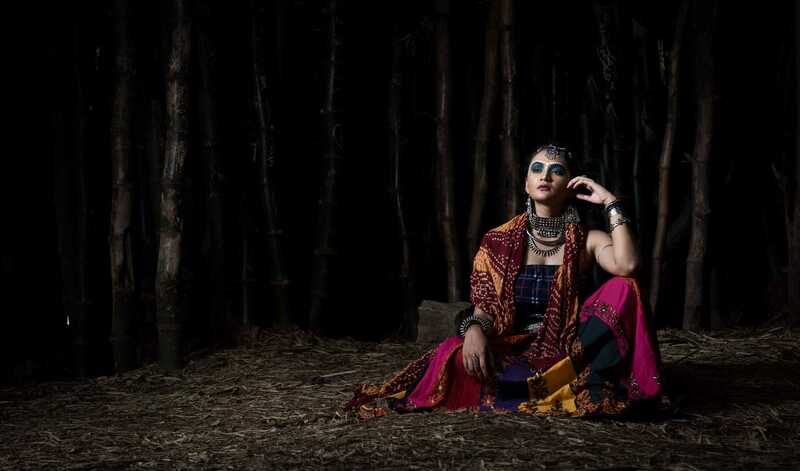 Sarees can be experimented with in a 100 different ways. Gone are the days when people wore them with boring blouses. 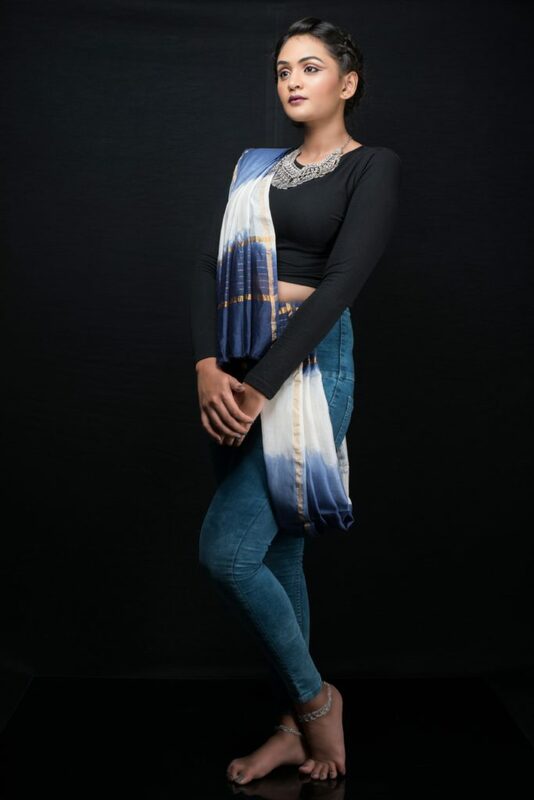 If you have seen my Quirkbox post, you know I styled a saree with jeans and a jacket. 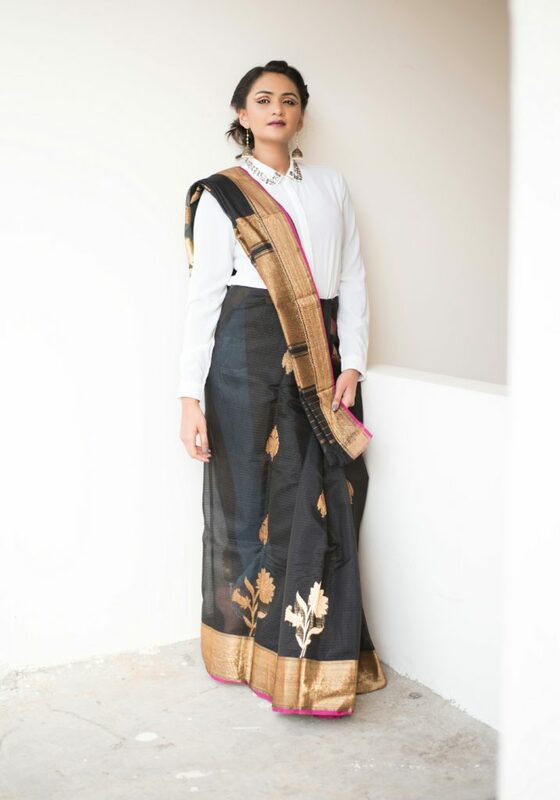 In this post, you’ll see that I have paired it with a white shirt, a denim bustier and a crop-top and to make my case stronger, we all know how Sonam Kapoor is giving everyone styling goals with her look from Cannes this year and also with her new label Wearerheason which has the very quirky ‘Palazzo Saree’. 8. Play with the draping, the way you like. I have done the slim pleats, the open palloo, a palloo draped over my shoulder to the front and even turned the palloo into a scarf. 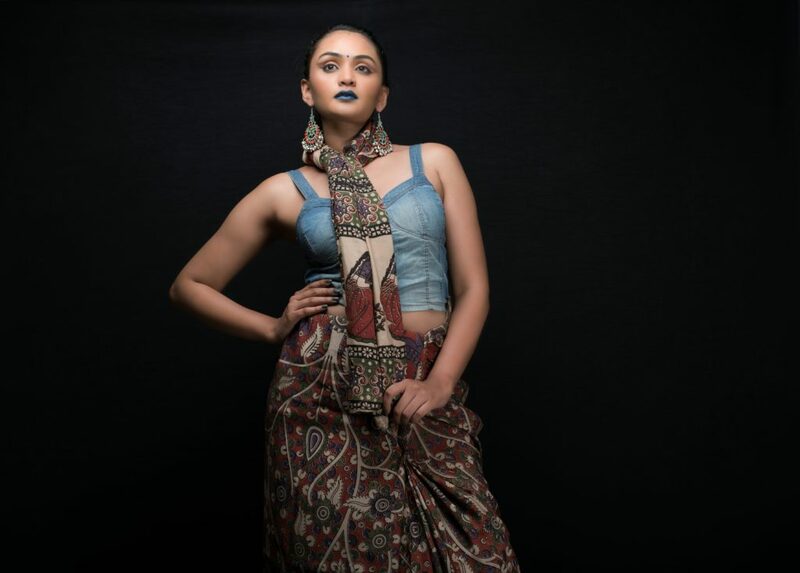 A saree can be made Avant-Garde by playing with the draping so next time you want to grab all the attention, you know what you’re wearing. 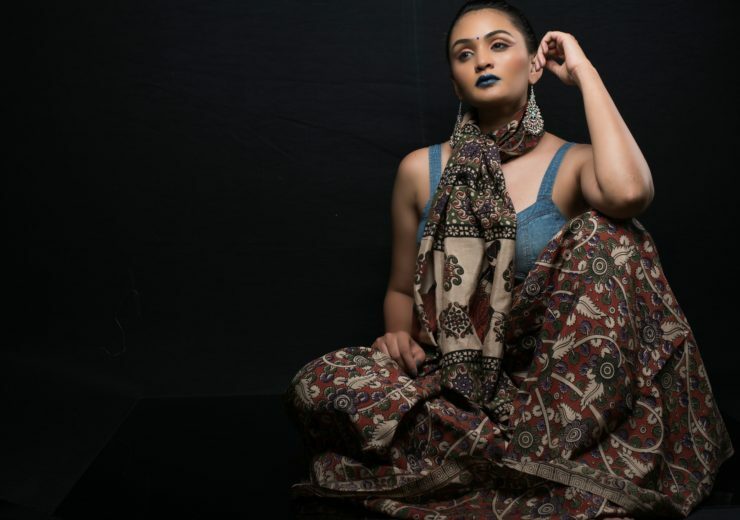 I even draped dupattas on my jeans to resemble the saree which is another thing you could try. 9. There’s a reason that we wear Sarees at weddings and at every important occasion here in India,right from the bride to the guests , so many different colors, so much bling, so many styles ! The ELEGANCE is unmatched. I rest my case. Myroots.desi is doing an amazing job of connecting artisans to consumers by establishing a direct link between the two. 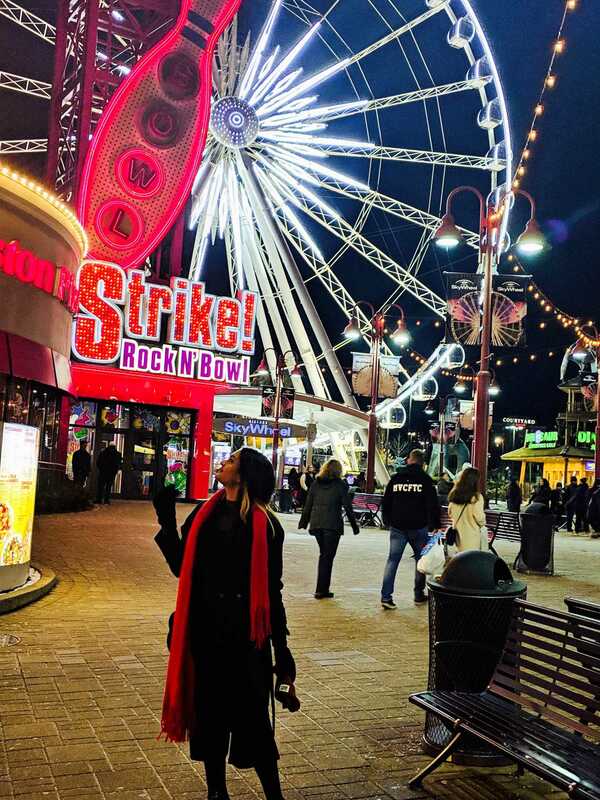 The products are beautiful, the products are of great quality, the price range is vast right and there is something for every budget and the variety is endless. They even have beauty products, home decor, blouses and bags ! If you’re a fan of re-decorating and love a desi vibe in your home, you know where to go. 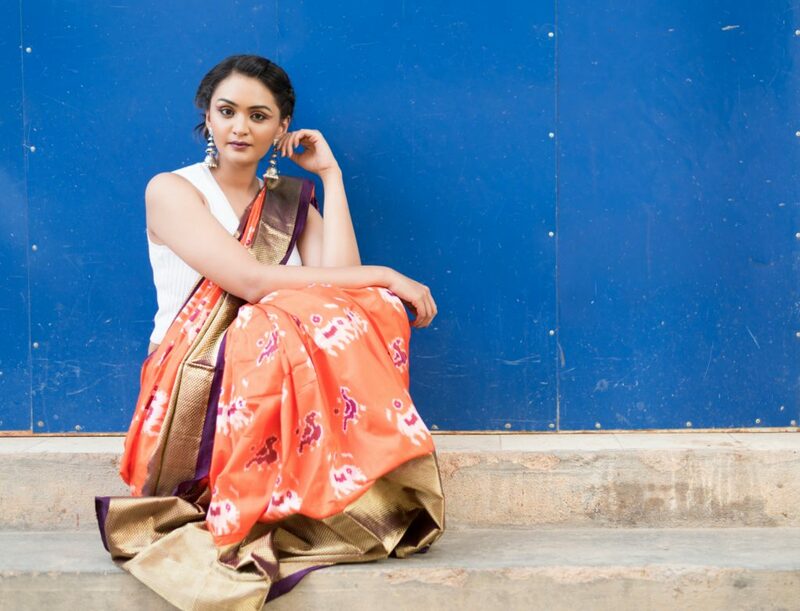 All the accessories i’m wearing here are from My Roots as well and if this post inspired you to add a little awesomeness to your wardrobe in the form of a Saree, Myroots is conducting an event called DESI KARIGARI where you can choose from a wide range of handmade and handwoven collecting, meet skilled artisans and organisations working with them. 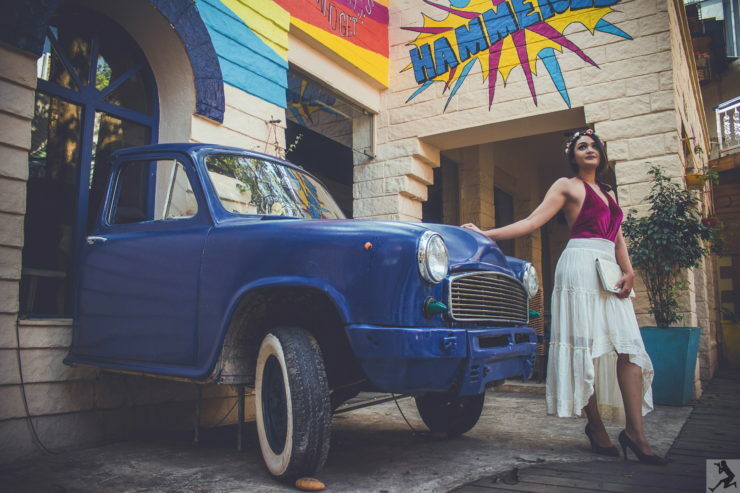 The event is taking place at Go Native, Jayanagar, Bangalore on 9th, 10th and 11th June. What are you waiting for? Until Next Post, XOXO !